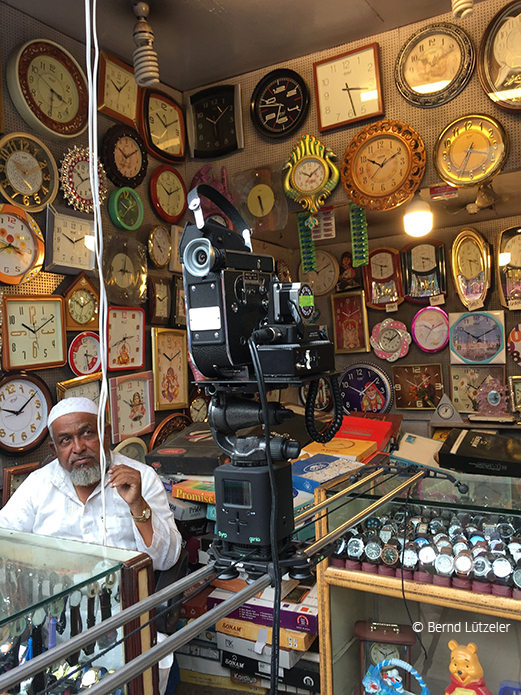 Armed with camera and local film crew, artist and filmmaker Bernd Lützeler, will embark on an exploration of Bangalore’s colourful small store scene, as part of his 16 mm film project «Endless Supply». Bernd Lützeler first studied painting with Christian Sery and Martin Assig at the European Academy of Fine Arts in Trier. In 1989 he moved to Berlin to study fine arts at the Berlin University of the Arts. The climate of change in the reunited city induced him to shift his practice away from painting towards photography, video, film and installations. In 1991 he participated in the programme Experimental Media Art with Rotraut Pape and completed his Meisterschüler in Maria Vedder's class. © Bernd Lützeler In the mid-‘90s he had the chance to see some Bollywood films, a genre largely unknown to the general public in Germany at that time. Fascinated by these films, he decided to further explore this subject. In 2001, he went to Mumbai to shoot an experimental video "True Love is Just Filmi", starring Tannishtha Chatterjee, Girish Pardeshi and Gyan Prakash. In 2004, he established "NoMasala", a varying programme of short films by Indian directors, which he presented in many places in Europe. Ever since, he has travelled to Mumbai repeatedly for longer periods to work on his film and art projects. Several works have resulted from these journeys: the experimental film "The Voice of God" (2011) with a voiceover by Harish Bhimani, the multimedia theatre performance "K⁰" (2011) in collaboration with Jyoti Dogra, which was funded by the Goethe-Institut / Max Mueller Bhavan Delhi, the structural film "Fultu Faltu Filim" (2017) and recently the double projection film "Camera Threat" (2017) starring Mansi Multani, Pushpendra Singh and Girish Pardeshi. Besides the references to popular Indian culture and life in urban India nowadays, Bernd's works often examine techniques of moving image production and presentation in relation to their form and perception. Loops, found footage, jugaad technologies (= DIY) and their disclosure have become integral parts of his work. His idea of experimentation includes the act of perception through the spectator. This approach can be seen in the film "Traveling with Maxim Gorkiy" (2014) in collaboration with Kolja Kunt, the music clip "Batagur Baska" (2016) for the music by Guido Möbius and in the film installation "Nola's saloN" (2014) in collaboration with Eric Wilhelm da Cruz. In his films and expanded cinema works, Bernd has been using all available formats, from digital video through small gauge formats like Super-8 and 16mm to 35mm film. He is an active member of LaborBerlin, an artist-run film lab that provides equipment and facilities to enable its members to process, copy and edit their own films, manually or with machines, and independent of commercial or industrial limitations. 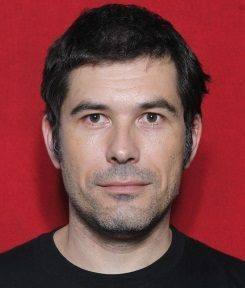 Bernd’s films have been shown at museums, exhibitions and film festivals worldwide, including Centre Pompidou, Berlinale International Film Festival, Rotterdam, San Francisco Cinematheque, Views from the Avant-Garde, and at Experimenta Film Festival as well as the Kochi-Muziris Biennale in India. 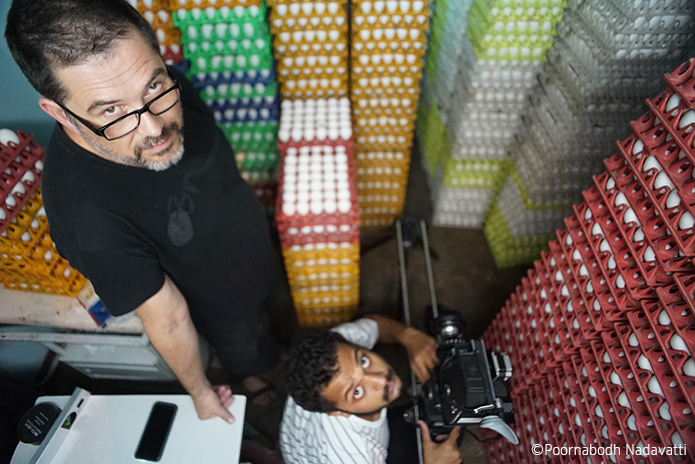 During the bangaloREsidency Bernd will get the chance to shoot for a new film project: Under the working title "Endless Supply", he will explore the world of local shops in Bangalore. The project will be shot on 16mm, the crew will consist of students of Srishti Institute of Art, Design and Technology, who will be introduced to analogue film practice and learn how to handle the film camera, a light meter and the film material. The final work will be presented as a loop. bangaloREsidency 2017 wasn't my first trip to India at all, in fact I've been coming to Mumbai repeatedly for more than 15 years, which has had has a great influence on my artistic work in films. Since it is a film metropolis, Mumbai is a very commercial place, which is one of the reasons why filming and filmmaking is extremely difficult over there. The moment you take out a camera, you will be either charged money, of told to put the camera down, or both. Over the years quite a few projects and ideas have piled up, which are impossible to realized in Mumbai. On the other hand Bangalore turns out to be an ideal place for such kinds of projects, since it unites the modernity of an Indian metropolis with a liberal atmosphere that is open for art and culture. So for me the bangaloREsidency looked like a great opportunity to apply with one of those projects. The city scapes of Indian metropoles are dominated by thousands of small shops that are filled with products galore. For my short experimental film "_galore", I was planning to shoot slow tracking shots with a 16mm film camera in as many small, jam-packed shops as possible. Since I only had five weeks time between other assignments, I had to gather a film crew before coming to Bangalore. Maureen Gonsalves of Goethe Institut and Shai Heredia of my hosting institution Experimenta India helped me a lot with that. The Goethe Institut even got a flyer designed to search for crew members, and within a couple of days, I had found three guys for me team: Siddharth Govindan, Poornabodh Nadavatti and Vishnu Nambiar. All 12 artists in residence arrived with the same flight in Bangalore after midnight. I was put up with two other artists, Felix Deufel and Thomas Heidtmann in a spacious flat with five (!) balconies in a neighbourhood called Malleshwaram. The next morning we were taken on a bus tour to give us an overview over the city and its art scene. 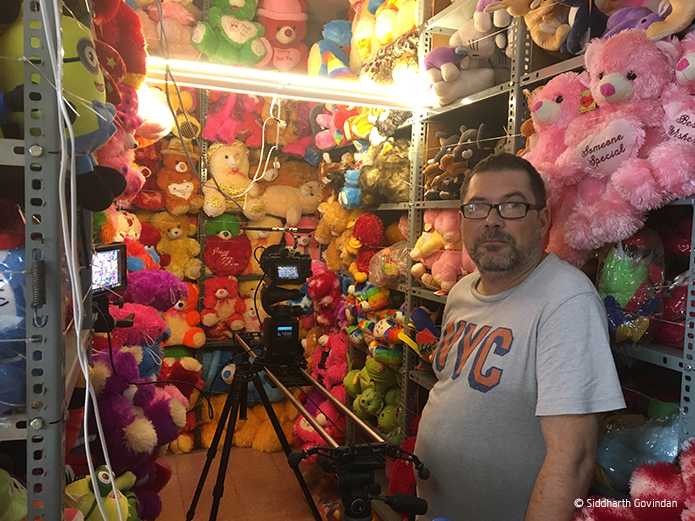 On day two I met my crew members and after a few days of technical preparations, we started hunting for shooting locations in the market areas of the city. Even though Bangalore has wide roads, large bridges, subways, parks, army compounds and high tech campuses, its city center still remains one huge area, with millions of people, goods, carts, animals, rickshaws and vehicles congesting the streets and alleys. From now on we threw ourselves into this turmoil every day, first with notepad and pen, later with cameras, rigs and lights. I can only thank my team for staying the course, walking with heavy backpacks, through the crowds and the jams, through the heat and the rains, and through the mud and the waste. After two weeks of running around we had permissions to shoot in 68 shops. This number rapidly decreased when it came to making concrete appointments with the owners. Finally we shot in 25 shops, which is more than I had ever hoped for. Since the film was still in postproduction by the end of the residency, the idea occurred that I could use the material of the film, and edit a trailer for the Experimenta film festival, taking place by end of November, which would open every film block. Since I am also earning money as a trailer editor in my second life, I saw it as a great challenge, to try to merge art and marketing, using my own footage. I think I can take pride in claiming that the trailer earned a good dose of applause at most of the shows, which is not very usual for festival trailers in general. In retrospect I can say that I had a really fantastic time in Bangalore, it was a great experience to be able to fully concentrate on shooting the film, without having to bother about anything else. The Goethe Institut also backed the project financially, which allowed me to work with amazing people. Great friendships and connections have emerged from this: Right now I have hired Siddharth Govindan for my current film shoot in Mumbai. During Experimenta I volunteered as the projectionist for 16mm films. When the idea to found an artist-run filmlab came up amongst a group of enthusiasts, I was able to help with words and deeds. I am sure that I will come back to Bangalore sooner or later, to realize another project. Finally I also have to admit that my project was very ambitious and extensive, especially considering the very limited time frame. As a result I hardly had the time to see other corners of the city, explore the local art scene or see the final presentations of my fellow resident artists. If I had the opportunity to repeat my bangaloREsidency, I would definitely come with more time for other activities. I want to thank the Goethe Institut Bangalore, Dr. Claus Heimes and Maureen Gonsalves for the invitation and the great support, to Shai Heredia of Experimenta India, who was an amazing host and resource of information and help, my crew Siddharth Govindan, Poornabodh Nadavatti and Vishnu Nambiar, who went through thick and thin with me, and without whom not a single frame of this film would have been exposed, the buddies of Goethe Institut Nora Duchêne, Agnes Ziegler, Anna Hofer and Sarah Denzinger, as well as Aditi Rajeev, who were always there when needed, Yashas Shetty of Indian Sonic Research Organisation, who kindly let us use his studio for one week, and last but not least Kunal Deshpande and Aliasger Dhariwala, who repeatedly visited us and kept filming us filming. I had a fantastic time and I will come back again!